WiFi Internet access has become a popular method of accessing Internet on the move. You can find WiFi networks from Airports, restaurants and etc to right inside our homes, so with increasing WiFi networks we have option of selecting the WiFi network of our choice. All of the above mentioned areas come with multiple WiFi networks and the default program that Windows or your WiFi adapter manufacturer provide gives you the available networks that you can choose and connect. 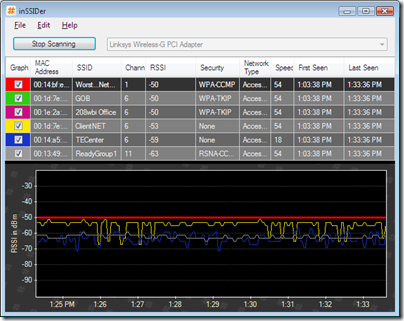 If you want to get know more details about the WiFi connection then there is a free utility called InSSIDer can help you to scan and find lots of details about the available WiFi networks. Find the signal strength of available WiFi network connections in dBm, this is a pretty useful feature that we can use to find out strongest available connection for better network performance. Technical details of WiFi networks like MAC address, SSID, channel, RSSI, security method used, type of network and speed of the connection can be found out. Works in Windows Vista and Windows XP.